Scotland’s animal welfare charity was alerted to the 12 inch long ‘lizard’ on Tuesday when the owner was checking on her feline. The Scottish SPCA were called in to rescue a giant lizard found hiding from the cold weather, only to discover it was an ornamental otter. 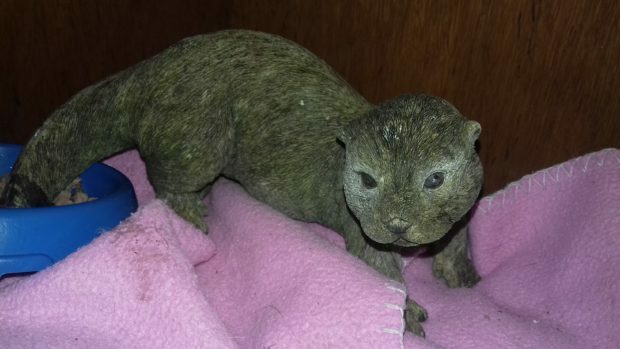 A concerned member of the public called the Scottish welfare charity after finding what appeared to be a disconcertingly large reptile inside her cat shelter in Aberdeen. Animal rescue officers were called by the startled homeowner who asked them to pick up the 12-inch “lizard” on Tuesday. The SSPCA’s Karen Hogg said: “The caller has a shelter set up in her garden as her cat doesn’t always want to come indoors. “When she went to check the shelter she noticed an animal intruder and got a fright. “I went to check on it and was surprised to find an ornamental otter. The rescue officer admitted the incident had brought a light-hearted moment into what can often be a very challenging job. “This job can be very tough as we deal with severely injured animals on a daily basis,” she said. “It’s quite nice when something like this makes us smile. “Last year one of my colleagues responded to a report of an injured bat on a bin but when she arrived she discovered the bat was plastic. In February, armed police were sent to Peterhead after a farmer spotted a tiger in his cow shed. Multiple units descended upon the property and checks were even made with a wildlife park before it became clear the animal was a toy. In 2011, meanwhile, a life-size stuffed tiger sparked a major police operation involved armed officers and a helicopter after several members of the public spotted what they thought was a live animal in a field in Hampshire. Anyone with a concern about an animal can call the SSPCA helpline on 03000 999 999.